Happy New Year everyone! I rather like this time of year, I feel positive and excited about the new year to come. Usually wears off by February by which time I've had enough of Winter and being cold lol. I think she's pleased with them and they fit well which is good. I used the Rye pattern and a fish lips kiss heel. My Dad has been dropping hints about some more socks as the ones I made him he's finding hard to get over his heel. 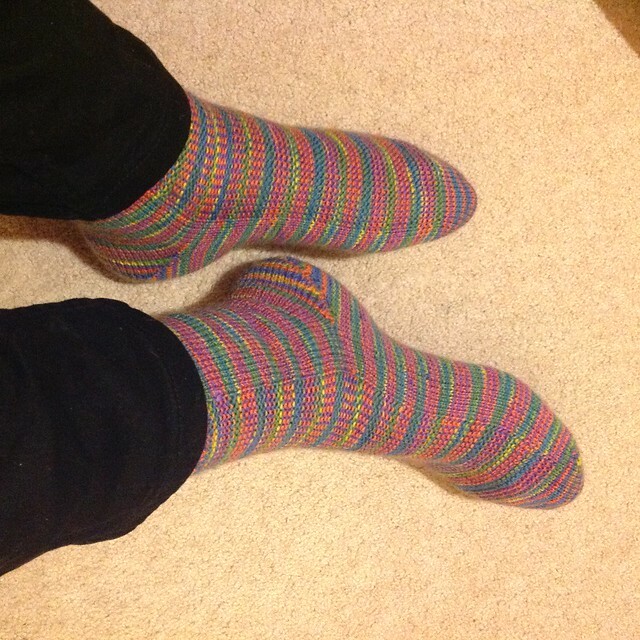 I used a gusset heel for them so would have though that would be fairly roomy. Any one have any suggestions? The gusset part doesn't have to go past the heel - is it possible the problem he's having is with getting the cuff over and past his heel? I have had that problem with a pair of socks where they shrank slightly and the cuff wasn't stretchy enough. I love how your daddy appreciates his baby girl's knitting. I'm sorry I don't have any suggestions as I'm kind of facing that dilemma myself. Terrific new socks for your mum. The colourway goes so well with the pattern and shows off each color. Thank you :) Let me know if you find any solutions! And sorry you were hit by a bad ear infection. I usually try to tough it out too before forcing myself to see the doc. Glad you're on the mend and much happier. Your Mom's socks are so cute. I have no suggestions for your dad's heels. I always do a heel flap so I have no other options. Thanks, I think you're right. I've had the children on my own today and trying to strike a balance between entertaining them, staying out of pain and not being too drowsy from the painkillers was rather tricky. Tomorrow they're back at school so I'm planning on spending as much of the day sleeping as I can lol.